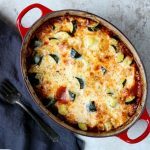 This One Pot Lasagna recipe has all the classic lasagna flavors that you love: pasta, sausage, basil, tomato, cheese… lots of cheese. Except this recipe is SO SIMPLE to make! It all comes together in one pot and is ready in under an hour. My love for lasagna is a life long love. When I was little, vegetarian lasagna was my requested birthday dinner every year. My Mom made her lasagna with carrots, zucchini, and cottage cheese. That is why I still like zucchini and carrots in my lasagna recipe. 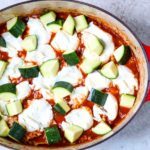 I truly love cottage cheese in my lasagna too, however, my husband would probably die of grossness if I put cottage cheese in his lasagna, so we opt for ricotta cheese instead. Back in the day I did not eat meat. Strictly vegetarian from age 12 to 27! It all stemmed from a bad dream that still haunts me if I think too hard about it. EWWWWW. Now-a-days I like a meat lasagna recipe. In this recipe I use a mild Italian turkey sausage. You could also opt for an Italian pork sausage. Lasagna can be super labor intensive to make. 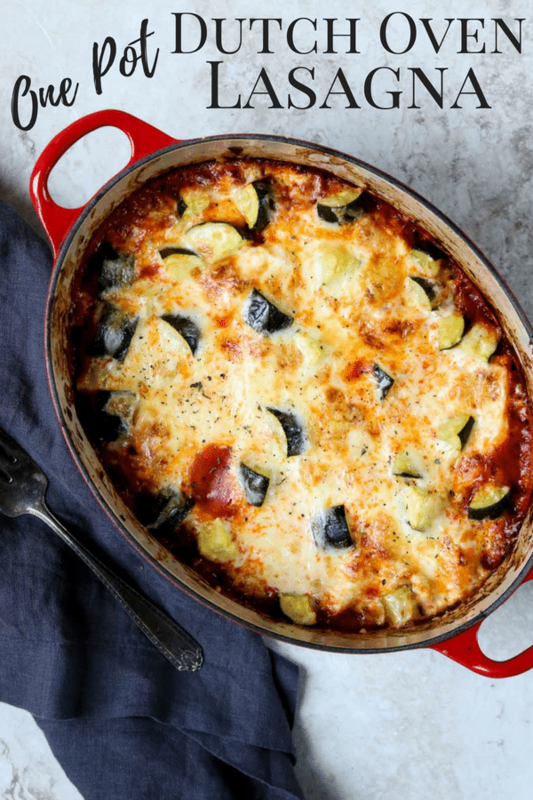 That is why I love this recipe for One Pot Lasagna. It all comes together in my dutch oven. There is no precise layering required! It is easy to make and easy to clean up. If you do not have a Dutch Oven (I use my 5 quart Le Creuset), you can use any heavy pot that has a lid and is oven safe (about 5-8 quarts in size). Pour in a jar of your favorite marinara sauce. Pour 1 cup of water into the empty marinara jar and shake it with the lid on. Now pour that into the pot. Stir to combine everything. Break 10-12 oven ready lasagna noodles into 3-4 pieces each. Nest those pieces into the sauce, making sure each piece is covered in sauce. Dollop the top of the sauce with tablespoons of ricotta cheese. Sprinkle the cut zucchini on the top. Place the lid on top and pop it in the oven for 30 minutes. Then remove the lid and sprinkle with the mozzarella cheese. Bake for an additional 10 minutes. If you want the cheese a little browned, like the picture below, you can turn on the broiler for a few minutes… but watch it carefully so it doesn’t burn the cheese. 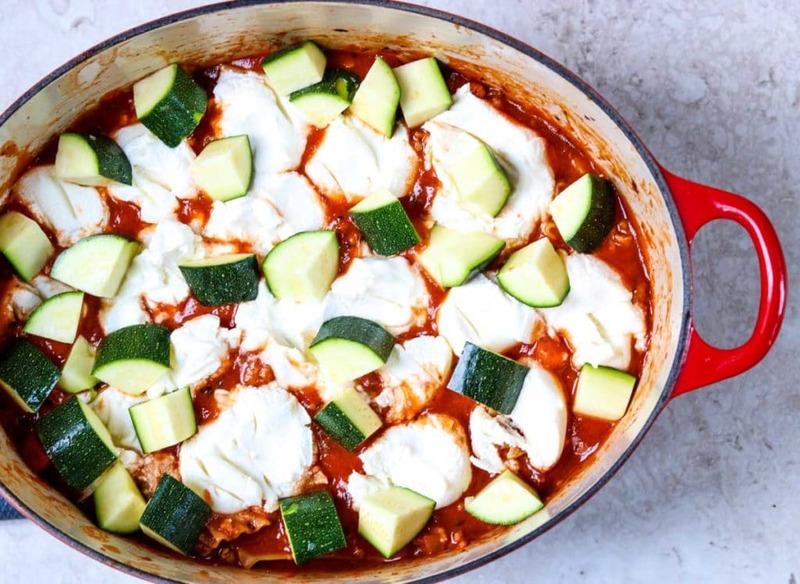 Let the Dutch Oven Lasagna rest for 5-10 minutes before serving. I usually reserve lasagna for the weekend or for a Sunday night family dinner. 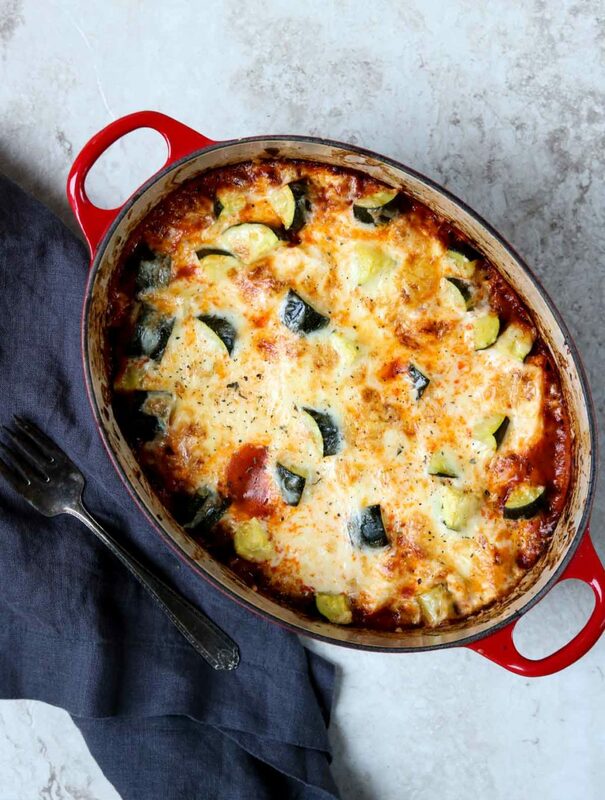 However, with this easy lasagna recipe you can plan this for a weeknight. I like to pair this recipe with a green salad or a caesar salad. Sometimes we will have garlic bread as well. 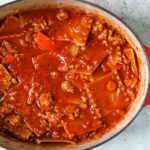 I hope you give this recipe for One Pot Dutch Oven Lasagna a try in your kitchen! 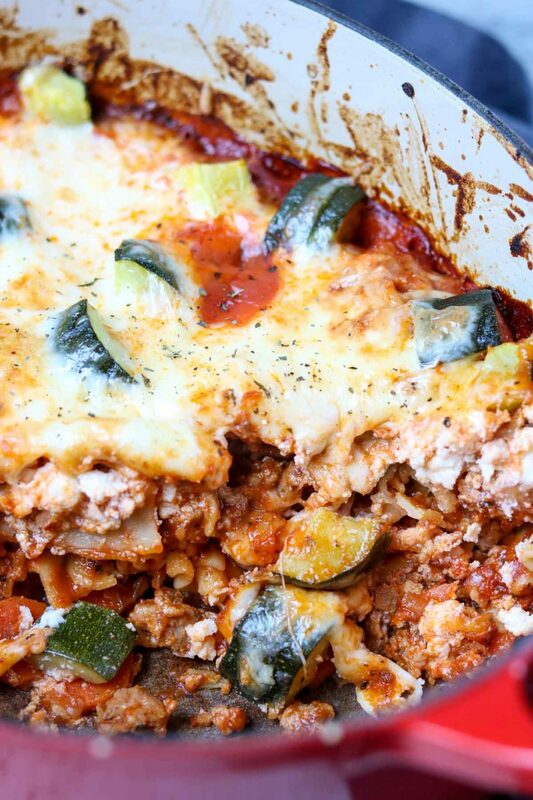 A super easy lasagna recipe that is made in one pot and is ready in under 1 hour! It is full of all the classic lasagna flavors that you love: pasta, sausage, basil, garlic, marinara sauce, and lots of cheese! In a Dutch Oven Pot (anywhere from 5-8 quarts in size), over medium heat, saute the onions, carrots, and garlic in oil until the onions soften, about 5 minutes. Add the ground Italian sausage and crumble while cooking thru. Kitchen Tip: If you choose to use a pork sausage you will want to drain some of the oil from the pot before moving on to the next step. Stir in the basil, oregano, salt, pepper, garlic powder, and onion powder. Kitchen Tip: To get ALL the sauce out of the marinara jar, pour the 1 cup of water into the empty jar and shake it around, then pour it into the pot. 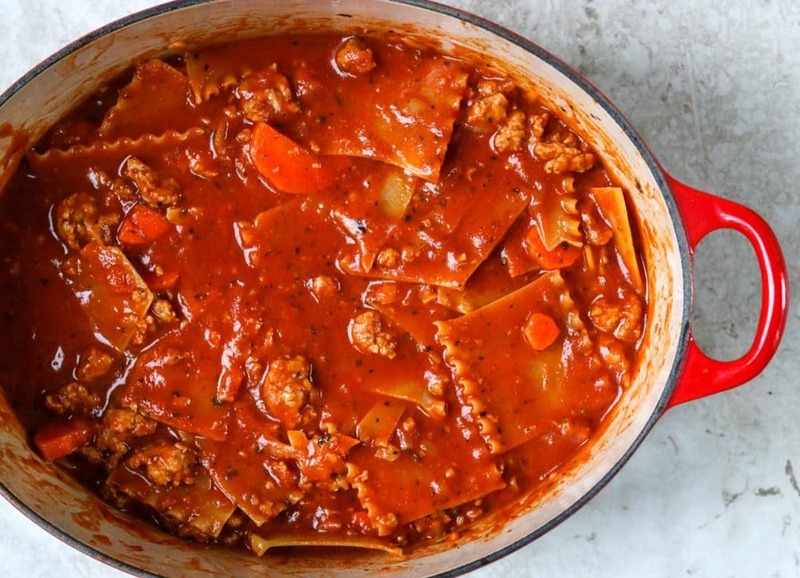 Tuck the broken lasagna noodles into the sauce, so that all pieces are covered with the sauce. See picture. Using a spoon, dollop the ricotta cheese across the top of the lasagna. Sprinkle the zucchini across the top. Put the lid on the pot and bake for 30 minutes. Remove the lid, add the cheese across the top of the lasagna, and bake for an additional 10 minutes. If you like the cheese golden on the top you can broil the lasagna for just a minute or two. I am soooooo into this as soon as the temps dip below hellfire. LOL! I am ready for fall weather. I love summer and a little humidity, but I am over the swamp-like conditions! This looks amazing!! 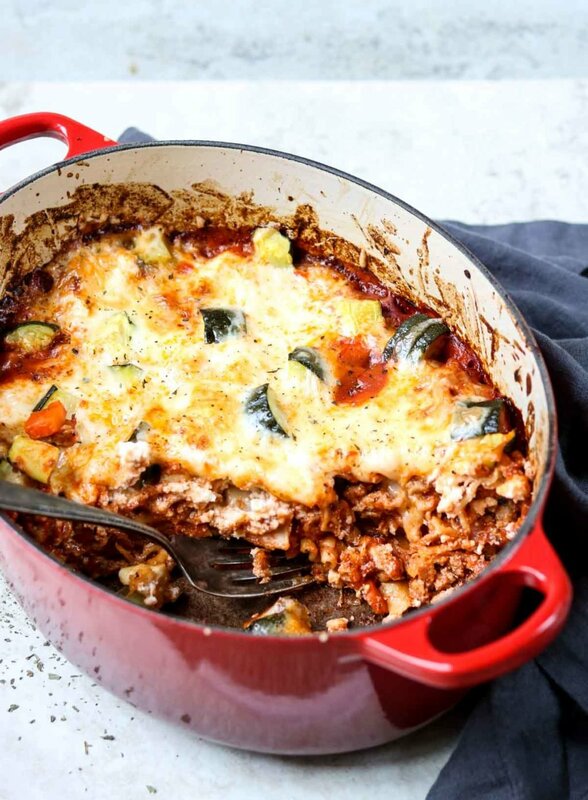 You had me at one pot…and again at lasagna 🙂 Definitely keeping this recipe around for the colder months as a dinner staple!